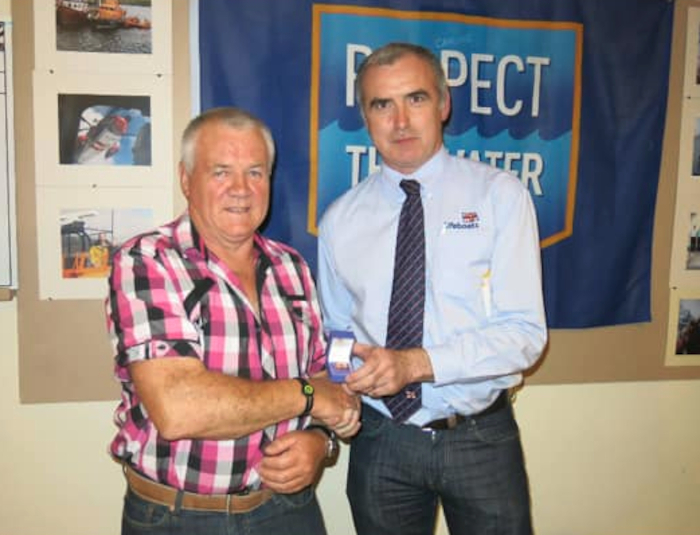 Mattie Stafford pictured with Declan Dixon from the RNLI when he received his 20 years Long Service Medal in recognition of his time spent on the lifeboat crew. In a warm tribute, the lifeboat station’s volunteers said that it was with deepest shock, regret and sympathy to his family and his wide circle of friends that they reported the untimely passing of their esteemed former crew member, emergency coxswain and current deputy launching authority, Mattie Stafford. Achill Island RNLI Lifeboat operations manager Tony McNamara said: "Mattie brought his many skills and ability not least in the fields of seamanship and mechanics to the Achill Island lifeboat over many long years. "There were few problems on land or on sea that would get the better of Mattie. He will also be greatly missed by the fishing community especially around Purteen Harbour where Mattie was for many years the ‘go to’ man to quickly sort a problem and get you to sea. "As a long standing and experienced crewman and coxswain, he was generous with his time and advice to new crew and his advice was always welcomed and valued on the lifeboat in difficult situations on many occasions. "Mattie was awarded the RNLI Long Service Medal following 20 years on the lifeboat crew. On his retirement from the crew, he took on the roles of deputy launching authority and on the station operations team. "We will miss his advice, experience and camaraderie and the Achill Island lifeboat family will be the poorer for his untimely passing. To his wife Kathleen, his children Jacinta, Matthew, Caitriona and Genevieve and his extended family we offer our support and deepest sympathy. Ar dheis De go raibh a ainm cinealta." Mattie’s funeral took place on Monday, in St Patrick’s Church, Pollagh, followed by his burial in Slievemore Cemetery.